As always, we had a blast learning about the environment yesterday. 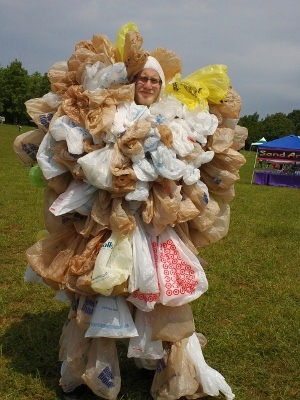 I spoke briefly with the guy wearing the plastic bags in the photo. He told me about his participation in urban stream clean-up efforts. You will probably never guess that plastic grocery sacks are the most common type of trash that they pull out of the water. I believe that as a society we can do better for the environment than to let plastic bags pollute our streams. The weather at EarthFest was a little rocky early on. There were a few sprinkles and clouds but the rain held off. The promised thunderstorms never showed and the air pollution is down. It turned out to be a good day for the environment and for everyone who attended the event this afternoon. 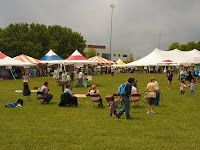 Here are a few photos from EarthFest Knoxville. 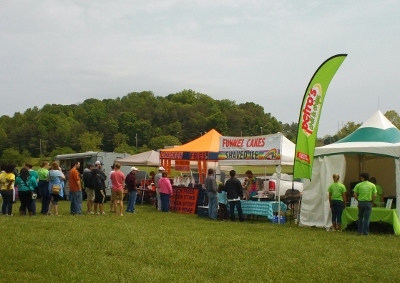 This was the concessions area at EarthFest. Every item sold came in environment friendly packaging. Even the funnel cakes were served on a frisbee. You could either take the frisbee home as a souvenir or recycle it at EarthFest in Knoxville. It never did rain yesterday but for about an hour the skies looked like they were ready to burst. As the clouds rolled in, the outdoor activities crowd thinned out. Everyone came back out after the sky cleared later. It's sort of appropriate for that to happen on a day dedicated to the environment. 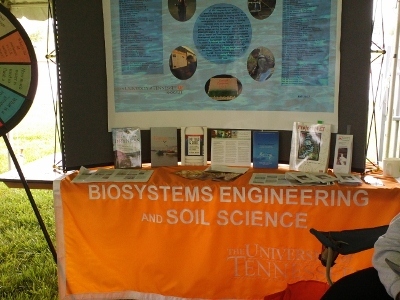 This display below by the Biosystems Engineering and Soil Sciences Dept. 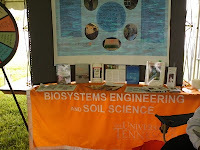 at UT helped EarthFest attendees learn about how our actions impact the environment. I was surprised to find out how small things can add up to big changes in the environment. Every thing that we do (or don't do) has its own impact. Each the exhibits taught us how to do a little more. Environment displays at were also exhibited by the Knoxville Recycling Coalition, Knoxville Utililtes Board, Tennova, Chevrolet, Ijams Nature Center and a bunch of other places. The list is too long to fit in any of the 3 blog posts on You've Been Reviewed. You will have to attend EarthFest next year so you can find out more about how to protect the environment. Green living is one area that we can all do a little better.